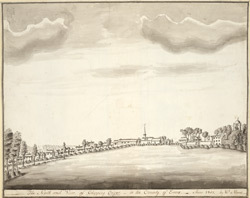 View from the north west showing the village of Chipping Ongar in Essex in 1801. Chipping Ongar dates back to Saxon and Norman times and is located in western Essex. This is one of two views of the village by William Moore. This view suggests it is a long, thin village, with houses lining the road up to the church. Various village buildings are clear enough to be identifiable including the Norman parish church of St Martin of Tours, and on the far left, the castle, on a mound of approximately 48 feet high.